TPC Overall Rank: #78 out of 2933 rides. In User Top 10: 66 times. As far as I'm concerned, this and farenheit are the 2 best rides in the park! The front seat is the only way to ride this thing and get the most out of it. This ride was exhilarating, but at the same time disappointing. I was excited to ride Storm Runner, because I had never ridden a ride with such an abrupt start. The ride looks intimidating, but once it starts, It's over in 30 seconds flat. This was a major problem with many of the roller coasters at Hersheypark; you get on the ride, go through a couple of great hills and loops, and just when it starts getting really great, it's all over. Luckily, we were visiting the park the first day it opened, so the wait time was only about 10-15 minutes. However, that is the extent of the negatives. In just thirty seconds, they somehow managed to cram in many hills and loops, with my favorite being the A-line twist. The sheer amount of air-time you got on Storm Runner was absolutely amazing, and I would definitely ride it again. Overall, it is one of the best roller coasters Hersheypark has to offer, but would receive 5 stars if it lasted longer. This is probably one of the best coasters Hershey Park has to offer. It only lasts about 30 seconds but it crams alot of drops and loops in that time. The lines usally go pretty fast considering there is two seperate trains and lines. I certinly enjoyed this coaster the only problem is that its the first ride to close down if it starts raining. I think Its one of the fastest rides at Hershey and I love how from anywhere you are in the park even the parking lot you can see the bright red tracks and yellow cars. 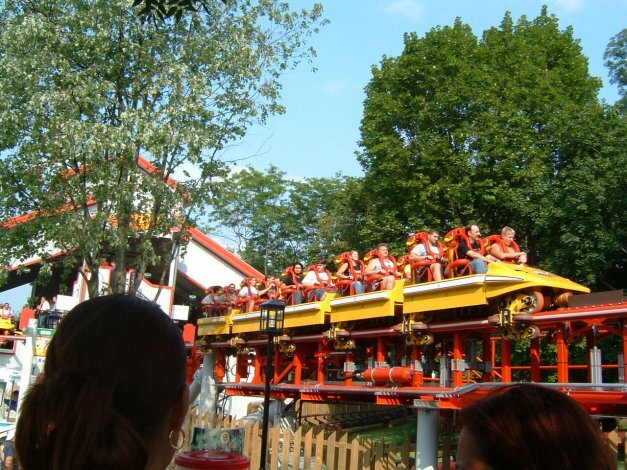 This is probably one of my faveorite rides in Hershey and anywhere else. The take off is probably one of the best parts of this coaster I mean 0 to 72mph.... pretty awesome! The first drop is crazy and the second is just as great. The corkscrew and loops were amazing. This is defiently my favorite ride at the park besides the new ride &quot;Skyrush&quot;. This is defiently not a ride that you want to miss so ride STORMRUNNER!!!!!! A gem of a ride, pity it's so short. The acceleration in the launch is insane and pulls some serious g's I still cannot believe the incredible airtime on that top-hat! Making the complete 180 so high in the air like that further exaggerates this feeling. The rest of the ride is a rush through nearby terrain. The highlight of course is the legendary &quot;flying snake dive,&quot; which is by far the most disorienting inversion I have ever experienced. The ride falls just short of true brilliance for two reasons. First, the restraints, while not terrible, still feel a little tight on the shoulders during the inversions. Second, it's just too short. A drop into the ravine followed by a turnaround would've been enough to push it among the very best out there. Still, this ride is a classic and the setting, sheer thrills, and airtime make it one of my favorites. This is one og the greatest coasters i've been on. It's only around 20 seconds long but it packs plenty into that small time and gives you the ride of your life on the back of a wild horse. When you first leave the station you hear the soud of the heartbeat over the speakers as you slowly roll out onto the platform to launch. Your seat pulls back as the brakes realease. &quot;Get Ready, Here We Go!&quot; is the last thng you hear before you're launched at 70 mph in under 2 seconds. The fealing is wild as you head toward a 150 ft. Top Hat at top speed. The drop leads you to a Cobra Loop, 2 Barrel Rools, Snake Dive and a twisting hill up to the finish brake slope. Once you do this ride, no matter how scared you were the first time, you'll find yourself doing it agian. I rode this ride twice on my 8th grade field trip, early 2004. If I remember correctly, it was definitely a thrill. :-) For me, the best at Hershey Park. Date Ridden: Summer of 2008. Times Ridden: 1 in the second seat. Here once again is a unique Intamin ride. Storm Runner has a powerful launch, a great Top-Hat, and an intense inversion called a Flying Snake Dive. This thing has to be seen to be believed. However, like so many Intaim rides that have been built recently, the restraint system causes a point to be taken away in my book. Millennium Force and Top Thrill Dragster are 2 Intamin rides that have received perfect 10&#39...s from me. That is not due to the fact that they are located at Cedar Point but rather due to the simple lap-bar style restraint system they have. However with Kingda Ka and their other looping sit-down coasters, these restraints just cause me to have to fight to be comfortable and that is not what a perfect coaster does. Maverick, Farenheit, and Storm Runner are all very similar to me. They are outstanding rides that could be 10&#39...s if their restraints were a little more comfortable. I still recommend the method I described in my Maverick review of placing the elbows against the back of the car and pushing forward slightly when entering an inversion. However, on Storm Runner, I was not prepared and took two seriously hard shots to the neck going through inversions. I will still give the ride the benefit of the doubt and score is as a 9. I know that with another ride, I would have been prepared and enjoyed the elements much more. Some positives of the ride include the launch, the top hat, and the unique inversions. Just be prepared when you enter them or you will leave with a sore neck. Overall Rating - 9.
the launch is great, but I felt like that was all the ride had to it as it didn&#39.t do much after the first hill, but it was quite thrilling. Definitely an exciting coaster... just something missing that&#39.s keeping it from that perfect 10 score. It certainly wont be the longest coaster you&#39.ve ever ridden... although part of that can be attributed to its lack of a lift hill. It&#39.s an exciting ride from start to finish, but lacking that one amazing element to elevate it to truly classic status. Definitely worth a couple rides anytime you visit Hershey Park.